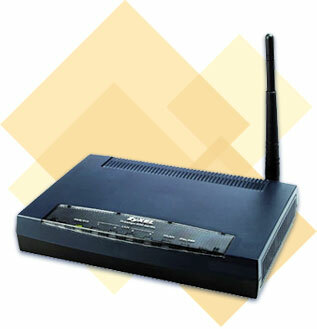 ZyXEL’s Prestige 660HW series is an all-in-one ADSL gateway for Home and SOHO applications. The ADSL gateway integrates a high-speed ADSL2+ port, 4-port 10/100Mbps auto MDI/MDIX Ethernet switch and a 54Mbps IEEE 802.11g wireless connectivity. The Prestige 660HW series provides SPI (Stateful Packet Inspection) and many Firewall security features to protect against network intrusion. Additional features such as Zero Configuration, Traffic Redirect, and MBM (Media Bandwidth Management), maximize performance while minimizing operation and maintenance costs. Management is further simplified with Web-based configuration and administrator wizards. High-performing, secure and easy to use, ZyXEL’s Prestige 660HW is the best choice for Home and SOHO needs. The Prestige 660HW series is capable of supporting high-speed ADSL, ADSL2 and ADSL2+ over existing copper lines. With speeds of up to 12Mbps (ADSL2) or 24Mbps (ADSL2+), the Prestige 660H/HW series offers higher data transfer rates and better bandwidth than traditional ADSL enabled gateways. The Prestige 660HW series also support RE ADSL (Reach Extended ADSL) for better performance at greater distance. The Prestige 660H/HW series offers the key link between today’s communications services and tomorrow’s converged services. Compliance with 802.11g wireless standard allows for data transmission speeds of up to 54Mbps. With 802.11g+ wireless technology, the Prestige 660HW series delivers wireless transmission rates of up to 100 Mbps when used with ZyXEL’s ZyAIR G-160 Wireless PC Card. The Prestige 660HW series easily extends a wired network for mobility and flexibility. The ICSA certified ZyNOS operating system ensures state-of-the-art Firewall performance and robust security from the Prestige 660HW series. Based on Stateful Packet Inspection, DoS (Denial of Service) and DDoS, it provides the first line of defense against hackers, network intruders, and other hazardous threats. The Prestige 660HW series enables network administrators to allocate network resources while guaranteeing Quality of Service (QoS). The MBM (Media Bandwidth Management) function prioritizes media services, increasing productivity and efficiency in daily operation by tailoring a system to specific demands such as VoIP, video streaming, video-conferencing and MP3 applications. The Prestige 660HW’s Zero Configuration technology allows users to hook up a DSL connection without hassle. The user-friendly design, which is embedded in the gateway, is OS independent and supports all kinds of operating systems in the host PC.